I was pleased to see Jodi Bromberg’s public announcement of InterfaithFamily’s new strategic plan in eJewishPhilanthropy, It’s a New Year, and a New InterfaithFamily. Congratulations to Jodi Bromberg and the Board and staff of IFF on reaching this milestone. I have a unique perspective to offer, as the founder of the organization, now retired from it. It clearly was the right time to take a hard look at IFF’s activities and to “focus efforts to scale them for maximum effect,” as Jodi writes. I think it makes great sense to focus on new interfaith couples and on interfaith families with young children, because those are the most critical stages at which interfaith couples make decisions about Jewish engagement, and because focus clearly is a good thing. Providing information on the Internet so it was available 24/7 was the first thing IFF ever did seventeen years ago; we updated the website several times but as things change so fast in that arena, it makes great sense to rebuild the digital strategy now to ensure that interfaith families do get what they are looking for, when they are looking. The Jewish clergy officiation referral service was certainly one of the most important initiatives IFF ever created. We always thought that having a positive experience with an officiating rabbi was likely to lead to future Jewish engagement, something confirmed much later by the Cohen Center Under the Chuppah study. We thought about trying to strengthen the relationships that couples seeking a referral developed with the rabbis on our list, but didn’t really implement that effort; I’m glad to see the attention given to that in the strategic plan. I was very proud to build the InterfaithFamily/Your Community initiative, with a full-time rabbi and support staff at its height in seven cities around the country. Each local operation was expensive, though, and one rabbi can only reach and work with a limited number of couples and families. I hope that the addition of a stipended rabbinic fellowship program will expand the number of trained clergy skilled at connecting with interfaith couples and connecting couples with each other, and look forward to a growing cadre of such active fellows. I do hope that the centers of excellence will continue to be offered. Finally, I’m glad to have seen our early efforts to provide training for Jewish professionals develop into the Interfaith Inclusion Leadership Initiative, and the focus on expanding IFF’s professional development offerings. I agree with Jodi that it is exciting to see the new strategy start to be implemented – and I hope that IFF will only go from strength to strength! I’m excited about a new phase in my professional life, and in the ongoing growth of InterfaithFamily. After founding InterfaithFamily as an independent non-profit in October 2001, and leading it until my able successor Jodi Bromberg took over as CEO in March 2015, and staying on to help as an employee through June 2016 – I’m no longer employed! But I’m not retiring, either. I’m now self-employed, as an independent consultant, continuing to address the issue I still care very passionately about: engaging interfaith families in Jewish life and community. I’m grateful to be consulting to IFF, initially on a half-time basis for the rest of 2016. I still think that IFF’s integrated web-based and local programming approach offers the single best available opportunity to engage more interfaith families Jewishly, and I still care very passionately about IFF’s continued growth. I’ll be working in particular on the Interfaith Opportunity Summit program that I developed for IFF in the first half of 2016 – and urge everyone interested in the issues to attend. I’m going to continue to write about interfaith family engagement issues on this blog – I hope you will sign up to receive my blog posts by email – and will be sharing what I write with IFF. I’m also available to speak at and consult with other organizations – if you’re interested, please connect with me. When I decided in 2013 that I wanted to continue to work at IFF but to find someone to take over leadership of IFF, most everyone said that a founder has to get out immediately (it’s euphemistically called the “graceful exit strategy” in business school circles). Jodi and I didn’t do it that way, but now it’s the right time: for me to add my voice to our cause on an independent basis, and to help IFF on a consulting basis where and when I can, and for IFF to soar under Jodi’s leadership. It’s an exciting time of opportunity for me and for IFF, and I’m eager to see how it unfolds. 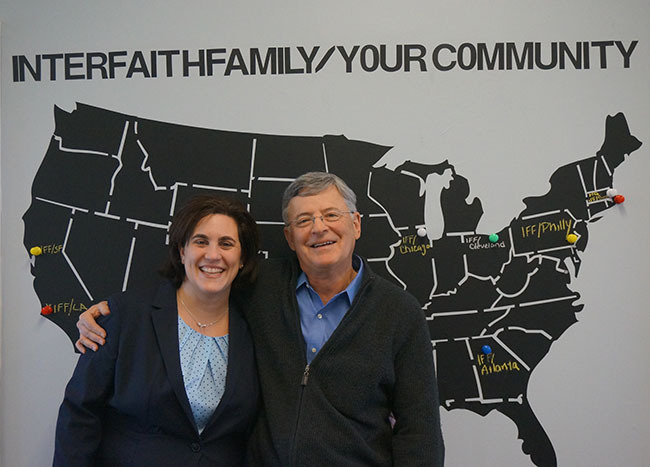 March 31, 2015 is a big day in my life and the life of InterfaithFamily, the organization I founded in 2001 and have led for the last fourteen years: Jodi Bromberg, IFF’s President for the last year and a half, will become CEO, and I will transition to a new Founder role. I hasten to add that I am not retiring and will continue to work for IFF. I will be focusing primarily on certain fundraising relationships and IFF’s advocacy work, subject to Jodi’s direction. My passion for engaging interfaith families in Jewish life and community is unabated, and there is much work to do. But I won’t be the person in charge. This transition is a milestone in a carefully thought out plan developed over the past three years with InterfaithFamily’s Board of Directors. In 2012, spurred largely by the rapid growth of our InterfaithFamily/Your Community model (see more below), I told our Board that while I wanted to continue to work with IFF, it was time for new leadership and to find a successor to be in charge of the organization. After an extensive search, we found Jodi to be the perfect combination of passion for the issue, and great leadership and interpersonal skills. Our expectation was that Jodi would learn about and take on responsibility for our operations and fundraising activities over a period of up to two years, and if successful in that interim period would be elected CEO by the Board. Jodi has done so well that last October, after only a year as IFF’s President, Jodi and I proposed that she become CEO on March 31, and the Board enthusiastically agreed. We are well aware that the accepted business school and consultant wisdom is that founders of non profit organizations should “get out” when successor CEOs take over. It’s called the “graceful exit” strategy. We are following a minority view, what’s called the “mutual success” strategy, based on successful cases of founders staying on and working productively under the direction of their successors. Many people say that I should be very proud of what InterfaithFamily has accomplished in the last fourteen years. When we started in 2002 it was me and a half-time editor, Ronnie Friedland, with a budget of about $200,000. Fast forward to 2015, and we have 24 on staff and three open positions, with a 2015 budget of $3.2 million. IFF started as a web-based resource. We expanded organically in response to “customer” demand, from personal narratives of people in interfaith relationships, to how-to-do-Jewish resources, listings of welcoming Jewish organizations and professionals, our Jewish clergy officiation referral service, and advocacy writing. By 2008, we had 282,000 unique visitors to the site. I always felt that local services and programs for interfaith families were badly needed, and always thought about InterfaithFamily filling that void. In 2008 and 2009, our then Board chair Mamie Kanfer Stewart and I spent a lot of time working with a group of Jewish family foundations who were developing a plan to “change the paradigm” on intermarriage to the positive. That funder group said that three things were needed: a “world class” website, training of Jewish leaders to be welcoming, and a range of local services and programs. Because of Madoff and a downturn in the economy, their plan was never funded. But it laid out a road map that I was determined to follow. The original plan was to run IFF/Chicago as a pilot for two years, refine it, and then seek to expand to other communities. But when Jeff Zlot, a lay leader in San Francisco, heard about the pilot, he said, “I want that in the Bay Area.” Coincidentally, the leaders of InterFaithways, a Philadelphia non profit founded by one of my heroes, Leonard Wasserman, expressed interest in merging with IFF. As a result, by mid 2012, I was waking up in the middle of every night with my mind racing with details of the Chicago, San Francisco and Philadelphia projects. That was the point I decided that we needed someone other than me, someone much better suited to manage a rapidly growing organization, to be our CEO. Since Jodi joined IFF in October 2013 we have continued to expand, opening IFF/Boston in 2013, an affiliate relationship with Cleveland in 2014, IFF/Los Angeles in 2014, and securing funding to open IFF/Atlanta by mid-2015; another major city federation told us just this week that they expect to fund our next IFF/Your Community starting this year. We have a strategic plan to be in nine communities by the end of 2016. My personal hope for the organization is to be in twenty communities over the next five years. I believe that the InterfaithFamily/Your Community model is the single best available opportunity the liberal Jewish community has to engage significant numbers of interfaith families in Jewish life and community. No one else is offering or proposing to offer anything that compares to our synergistic, national and local, top-down bottom-up approach of national web-based and training resources, and a comprehensive range of services and programs on the ground in local communities. We are executing well on our very ambitious offerings – traffic to our website grew by 30% in 2014 to over 864,000 unique visitors, and if we grow at half that rate we will reach 1 million visitors in 2015. We have developed a resources and training capability that can now help organizations all over the country be more welcoming, and we are demonstrating impact in our local communities, with thousands of interfaith couples becoming aware of what is available to them in their local Jewish community, building trusted relationships with our staff, and engaging in Jewish learning experiences that build community with other Jewishly-engaged interfaith families. Because of what we do, thousands of young Jews with one Jewish parent are engaging in camps, youth groups, Israel trips and other Jewish learning experiences. I am highly confident that Jodi Bromberg will lead IFF on this path of continued growth. She has a wonderful way of working with people and working through process that is not my strong suit (to put it mildly). She understands the need to put mechanisms and procedures in place so that the high level of activity and expansion can be controlled and managed well (I would tend to want to do everything myself). She has her own compelling personal story underlying her passion for our cause. IFF’s future will be very bright with Jodi in charge. I look forward to continuing to contribute as best I can. I have a very long list of people to thank for their part in making InterfaithFamily’s success and growth possible. I’m looking forward to doing that on October 22, when IFF is having an Afternoon of Learning and a reception at which I will be honored, along with another of my heroes, CJP President Barry Shrage. But I would be remiss not to mention Heather Martin, IFF’s Chief Operating Officer, who has put up with me since 2004. Whatever I went out and promised to funders and partners, Heather always made it happen. It would not be an overstatement to say that none of IFF’s growth would have been possible without her involvement. Fortunately, Heather and Jodi have developed a great relationship, making me even more optimistic about IFF’s future. We were sorry to learn that Jennifer Gorovitz will be stepping down as CEO of the San Francisco-based Jewish Community Federation and Endowment Fund. Most of the commentary has focused appropriately on the small number of women who have lead federations – Jennifer was the first woman to head a large city Federation in North America – and expressed hope that many more will follow in her footsteps. We’re feeling a loss more personal to InterfaithFamily in particular and the field of engaging interfaith families more generally. Jennifer was a leader among Federation leaders in championing the importance of Federations taking action to engage interfaith families. She was instrumental in making funding possible for InterfaithFamily/San Francisco Bay Area, and spoke about the project with us on a panel at the 2012 General Assembly (the Federation system’s annual conference). Fortunately IFF has a lot of strong support in the San Francisco Jewish community – and that community has a lot of strong leaders. We wish the Federation well in their search to replace Jennifer and hope they find someone who shares her passion for engaging interfaith families in Jewish life and community. And we especially wish her well as she builds the next chapter in her life. We are very pleased to announce that, thanks to a generous new grant partnership with Combined Jewish Philanthropies of Boston, InterfaithFamily will be launching InterfaithFamily/Boston this fall. This will be our fourth InterfaithFamily/Your Community, joining Chicago, Philadelphia and the San Francisco Bay Area in our growing network of local community programs. People in interfaith relationships will connect with Greater Boston Jewish community resources as well as with others like them, through an active “interfaith ambassador” working on engagement and relationship building, resources and referrals for supporting life cycle events, a Greater Boston Community Page and robust listings of organizations, professionals and events on the online IFF Network, active social media, and traditional PR and marketing. Jewish professionals and organizations will learn to attract, welcome and engage people in interfaith relationships, through inclusivity and sensitivity trainings, and resources on the IFF Network. We will be working closely with other Greater Boston interfaith engagement organizations funded by CJP (URJ – Reform Jewish Outreach Boston, the Jewish Community Centers of Greater Boston, and the Jewish Discovery Institute) to help promote the programs they offer and build relationships with their program participants. We have begun the hiring process; links to the Director and North Shore Ambassador positions are http://www.interfaithfamily.com/directorboston and http://www.interfaithfamily.com/nsambassador. Stacie Garnett-Cook, National Director of InterfaithFamily/Your Community, will supervise the Director of IFF/Boston. Deb Morandi, our Connections Coordinator, and Lindsey Silken, our Managing Editor, initially will be providing marketing and project management support. Going forward, we are immediately seeking additional funding not only to continue the new staffing beyond July 2014, but also to expand it to a full time Project Manager, which will enable us to expand the above activities and add other key objectives of our model: helping new couples learn how to talk about and have religious traditions in their lives together, and helping people in interfaith relationships learn how – and why – to live Jewishly, through an array of consultations, workshops/group discussions, and classes. We are extremely grateful to CJP for making this growth of the InterfaithFamily/Your Community initiative possible. Yesterday Ari Moffic and I had the privilege of participating in the Jewish Federation of Greater Washington’s Welcoming Interfaith Families: A Community Conversation with more than one hundred professionals and interested individuals. It was very affirming to hear the top leadership of the Washington Federation – Steve Rakitt, CEO, and Stuart Kurlander, President – express their commitment to engaging interfaith families in Jewish life in the DC Jewish community. Ann Bennett, the Chair of the program, and Marci Harris-Blumenthal, the Federation’s Director of Community & Global Impact, put together a great program. Our friend Marion Usher played a key role helping to design and facilitate the program. The program started with an interfaith couple telling about their Jewish journey, starting with Marion’s Love and Religion workshop and continuing to membership in Adas Israel, a leading Conservative synagogue. Several organizations gave brief presentations about their programs and resources, including our own InterfaithFamily/Your Community, the DC JCC, 6th & I Historic Synagogue, JOI and its Mother’s Circle program, the Federation of Jewish Men’s Clubs, and PJ Library. Next came breakout sessions on various topics – I attended one Ari Moffic facilitated on preparing for bar/bat mitzvah. It was a great discussion – the mother who started the program said she had recently received the date for her son’s bar mitzvah, I believe four years in advance; not having had a bat mitzvah herself, and with a husband who is not Jewish, she was already wondering how she would include her husband’s family. One participant pointed out the opportunity for parents who had not experienced bar or bat mitzvah to learn along with their child if they wanted to, including learning how to read Torah. We got some great ideas for additional resources to put on our Bar and Bat Mitzvah Resource Page that would help interfaith families prepare, ranging from lists of questions synagogue members should ask their synagogue professionals, to tips for parents thinking about whether or not to have a bar or bat mitzvah. After a presentation about the play Love, Faith and Other Dirty Words created by the New Center for Arts and Culture, a panel described in Ari’s blog post shared their interfaith experiences. Like Ari, I was struck by how much of the concluding conversation concerned rabbinic officiation at weddings of interfaith couples after an interfaith couple told of their difficult experience. It reinforced to me how important it is for communities to make it easy for interfaith couples to find officiating clergy. All in all it was a great conversation and we are very much looking forward to the next steps the Washington community takes. The Federation is making some of the presentations available on a new page on its website: be sure to check out shalom.dc.org/interfaithresources. We are thrilled to announce that InterfaithFamily has received a “core grant” from the Natan Fund. Core Grantees are those organizations most closely aligned with Natan’s grantmaking mission. Their exceptional leadership develops programs with significant and measurable impact, and they have the potential to make systemic change in the field in which they are working. Considering who the other core grantees are, the honor is even greater: G-dcast, Hazon, Ikar, Keshet, Moishe House, and Olim Behayad (an organization that enables Ethiopian Israeli university graduates to find academic employment). And the honor is still greater because the recognition comes from “a giving circle of young philanthropists dedicated to funding Jewish and Israeli nonprofit innovation,” as described in eJewishPhilanthropy last week. I’m pleased to report that the New York Jewish Week has published my op-ed, What Draws Interfaith Families to Jewish Life. A considerably longer version is on the Huffington Post, A New Year To Engage Interfaith Families in Jewish Life. Having just come off Yom Kippur’s intense period of introspection about the past and the future, it feels that the time is now right for this call for a new sustained effort to engage interfaith families in Jewish life and community. You can find the report on the first year of our InterfaithFamily/Chicago project here, and the report on our holiday surveys here. Awareness and Connection. People in interfaith relationships need to be made aware of the resources in their local Jewish community – organizations, professionals and programs – that are interested in welcoming them, and they need easy avenues to connect to those resources and to others couples like them in their community. Warm Welcomes from Jewish Organizations and Leaders. When interfaith couples and families do connect with Jewish community resources, they need to find a genuinely warm welcome. Officiation as an Entryway. Interfaith couples should find it easy to find clergy to officiate at their weddings and other life cycle events, and officiating clergy should stay connected with their couples and help them connect to Jewish life and community. Help for New Couples Making Decisions about Religion. Newwly married or seriously dating interfaith couples need help learning how to talk with each other and make decisions about how to have religious traditions in their lives together. Help Learning How and Why To Live Jewishly. Interfaith couples and families need help learning how they can live Jewishly – and how doing so can add value and meaning to their lives. Awareness and Connection. Rabbi Ari Moffic, Director of IFF/Chicago, introduced the project this year in meetings with more than 60 local organizations and professionals, led or participated in 9 adult education classes and other programs, and blogged and tweeted frequently. As a result the IFF website had 36,559 visits from the Chicago area, the new Chicagoland Community Page had 3,200 visits, we added 15 more local clergy to our officiation referral list for a total of 31, and we added to our Network 46 more organizations for a total of 72, 56 more professionals for a total of 70, and 154 more non-professional individuals for a total of 241. IFF/Chicago was featured in a story in the hanukkah-1221-20111221_1_interfaith-couples-interfaithfamily-com-jewish-life”>Chicago Tribune, in a local community paper, and in the JUF News. Officiation as an Entryway. The IFF Jewish Clergy Officiation Referral Service responded to 103 requests for officiation, and Rabbi Moffic had 24 follow-up conversations and 5 in-person meetings, all aimed at connecting couples beyond their wedding ceremony to synagogues and other community resources. We created two resources, available to members of our Resource Center for Jewish Clergy, for clergy to use to stay in touch with their couples. Help for New Couples Making Decisions about Religion. IFF/Chicago offered a hybrid online/in-person four-session workshop, Love and Religion created by Marion Usher, Ph.D., in February with four couples participating and again in May with eight couples. The in-person sessions facilitate community building, while online sessions make it easier for busy young adults to participate without going out every week. In post-workshop surveys most participants said that they felt empowered to talk about interfaith issues with their partners, and that they gained an understanding of how Judaism can fit into their interfaith relationships. Three workshop offerings have been scheduled for the second year. Help Learning How and Why To Live Jewishly. We developed and offered our first hybrid online/in-person class, Raising a Child with Judaism in Your Interfaith Family, to 21 couples. It includes eight sessions learned online with background reading, audio and video files, and personal journal entries and discussion board posts commented on by the facilitator, and two in-person meetings, a Shabbat experience and a wrap-up session. Each session is designed to teach a Jewish practice that responds to a universal parenting need and value (having a calm and reflective bedtime, appreciation for food and concern for hunger, making a regular time to be grateful, ethical behavior, etc.). Almost all respondents to the post-class surveys said that they felt more knowledgeable about Judaism and Jewish practice and gained more of an understanding of how Judaism can fit into their interfaith family; 10 respondents said their practices had changes as a result of the class to include saying the bedtime Shema, the Hamotzi, and/or Shabbat blessings. In the second year we will have two offerings of Raising a Child and two of our next class, Preparing for a Bar or Bat Mitzvah in Your Interfaith Family. JESNA is our evaluation consultant and will be administering surveys, conducting follow-up interviews, and issuing a report in 2013. But we are already confident that our model is meeting its important goals. More resources are being listed and attracting more traffic. Professionals are more aware of and sensitive to the needs of interfaith families. Couples are finding clergy to officiate at their life-cycle events and through our workshop are learning how to talk with each other and make decisions about religious traditions for their family. Parents with young children are learning about Judaism and Jewish practices and trying them out. Every Jewish community should have on-the-ground staff whose job is 100% aimed at addressing these needs of interfaith families in order to engage them Jewishly. The IFF/Your Community model is the first framework that has ever demonstrated the ability to effectively work toward that result, and it can and will be enhanced and expanded as we continue to learn from our experience in Chicago and new communities as we add them. We are close to having the funding necessary to implement IFF/San Francisco and IFF/Philadelphia later in 2012, we have an ambitious plan to be in eleven communities in five years, and we have just launched a job search for a national Director of IFF/Your Community to manage this growth. We think this is “big” and we hope many Jewish leaders will agree. Board chair David Steinhardt says, “Natan continually takes risks on new ideas, new people and new initiatives, while at the same time remaining committed to current grantees that are demonstrating success.” We’re thrilled that the young funders participating in Natan have re-affirmed their confidence in the importance of IFF’s work. Cindy Sher, Editor of Chicago’s Jewish newspaper JUF News, wrote a great article about InterfaithFamily/Chicago last week, Navigating Jewish living with interfaith families. She interviewed two Chicagoland interfaith couples, features our Love and Religion workshop that started last week and our Raising a Child with Judaism in Your Interfaith Family class that is starting at the end of the month, and highlights that “IFF/Chicago has teamed up with several Chicago-area Jewish organizations on interfaith programming, including PJ Library, the JCC’s Shure Kehilla program, and the Community Foundation for Jewish Education’s Principal Kallah.” We are very pleased with the progress of our InterfaithFamily/Chicago pilot and excited about the opportunities to replicate it in other communities.